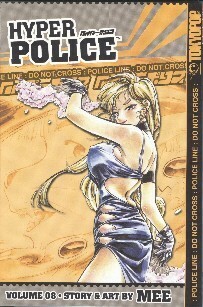 Hyper Police is one of my favorite manga. It’s funny, fast-paced, with a little fan-service thrown in for good measure. Toss in a cat-girl, werewolf, kitsune, and rampaging mice, and you have a great story! Volume 8 continues where 7 ended, with the nasty mice gang using a mechanical doll to try and ruin Natsuki’s reputation by committing felonies dressed as her. Through the entire volume, the plan seems to be working. Finally, they get caught in the act of switching the doll’s clothes, and get caught. Once again, the art for this manga in great. The story is hilarious, and there’s lot’s of furry fan service. The only problems seem to be one of pacing. It’s so fast-paced, that sometimes you can get lost. Try not to let that happen. Overall, I give this one a thumbs up. You can buy it at the Tokyopop website, Amazon.com, or your local bookstore.